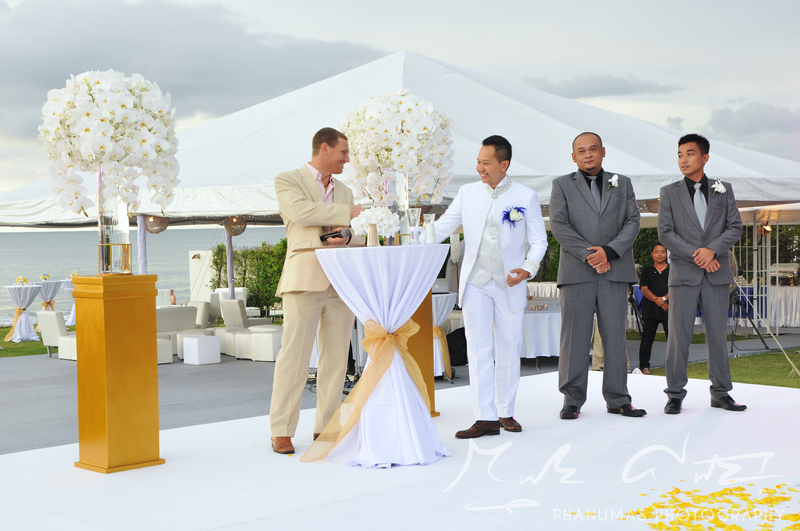 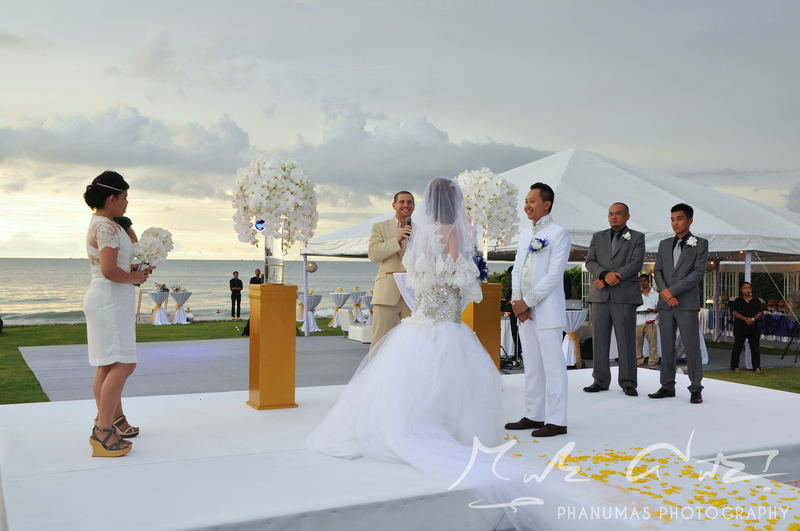 Triadi, the groom, and Devi, his beautiful bride, chose to tie the knot for their destination wedding in Thailand. 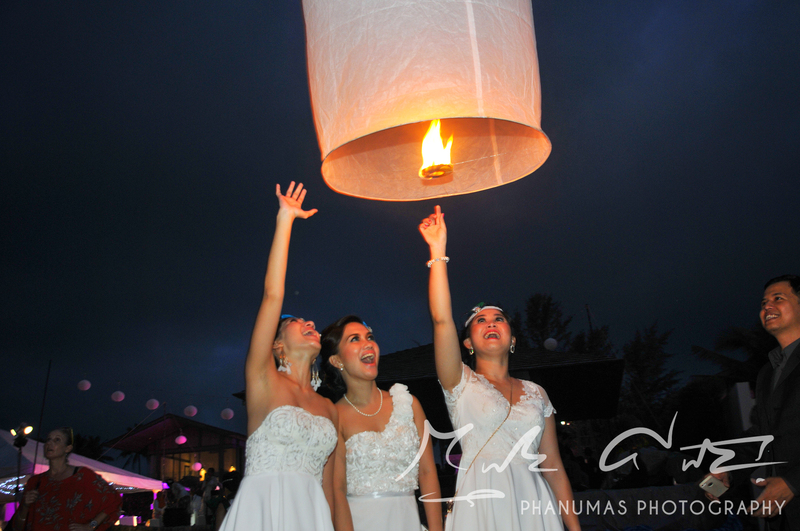 They didn’t want to leave anything to chance, so enlisted the wedding planning services of Sarah at Siam Weddings. 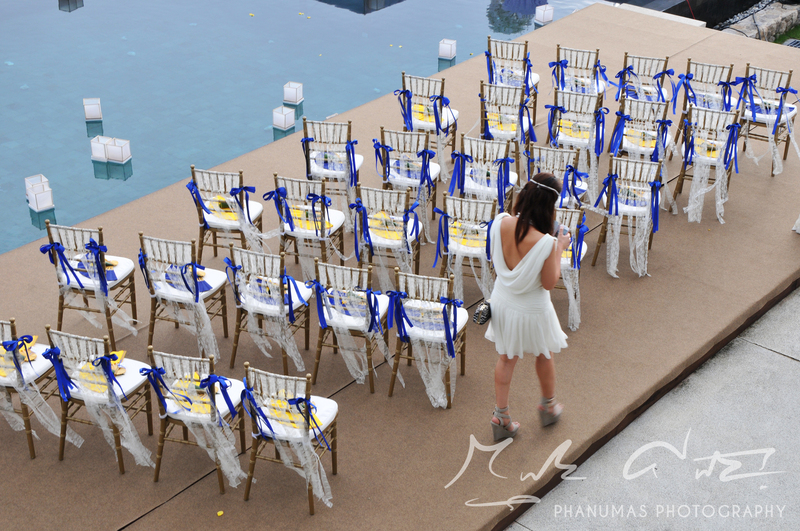 With her laid back approach yet total professional approach, to make their planning process and day run smoothly. 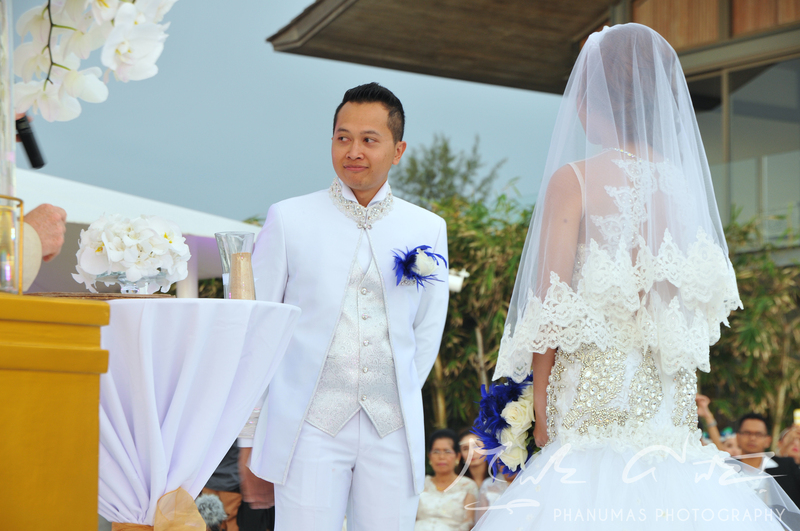 Sarah set to work to find an amazing luxury private, beachside villa for their wedding wedding venue. 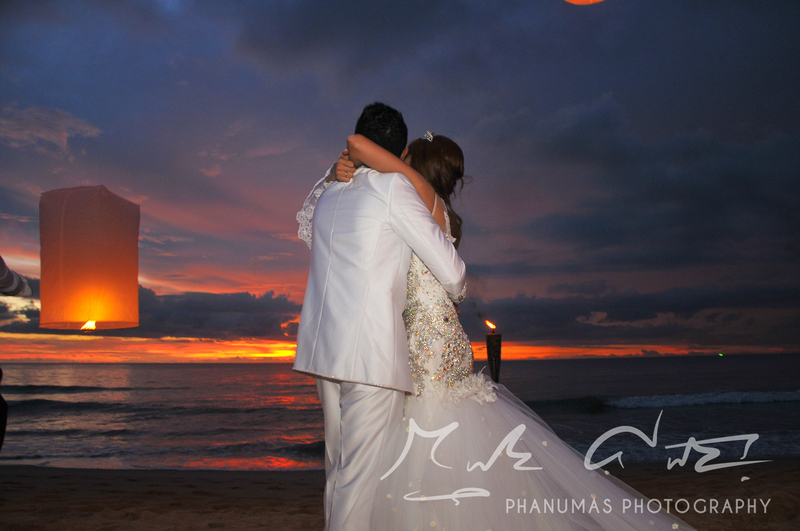 Triadi and Devi fell in love with the amazing Sava Villas located in Naithai beach, just outside of Phuket. 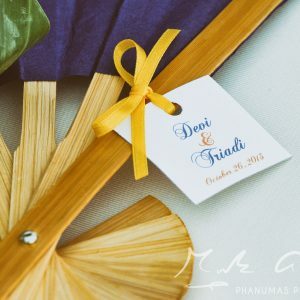 Triadi and Devi, both Indonesian, met in the home country of Indonesia. 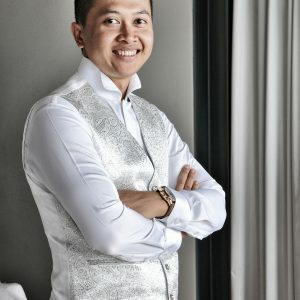 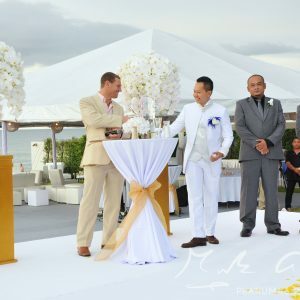 As Triadi was of the Christian faith, they wanted to make their marriage legal and decided on Thailand because of its beauty and was one of their favourite destinations in South East Asia. 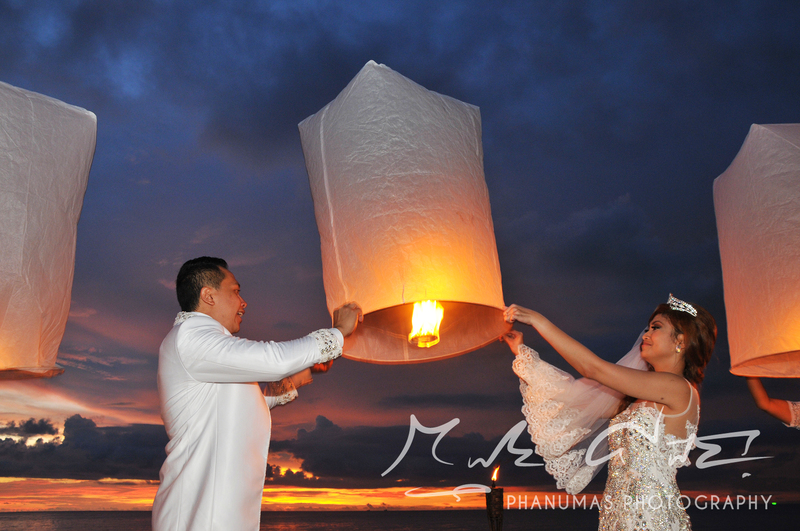 Their journey started with a fun pre-wedding photo-shoot in Old Phuket Town, mainly in Soi Romanee and finished with a dramatic backdrop near Nai Harn in the south of Phuket island. 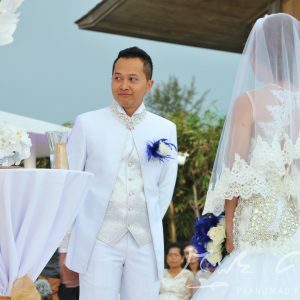 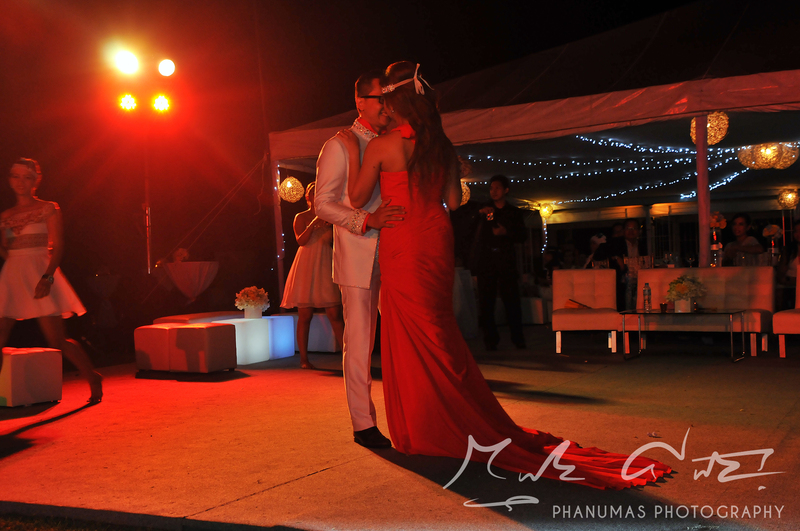 Triadi and Devi wanted to hire a professional Thailand photography and video team to capture the emotions of fun and happiness at their amazing wedding day at Villa Essenza, Sava Villas, Phuket. 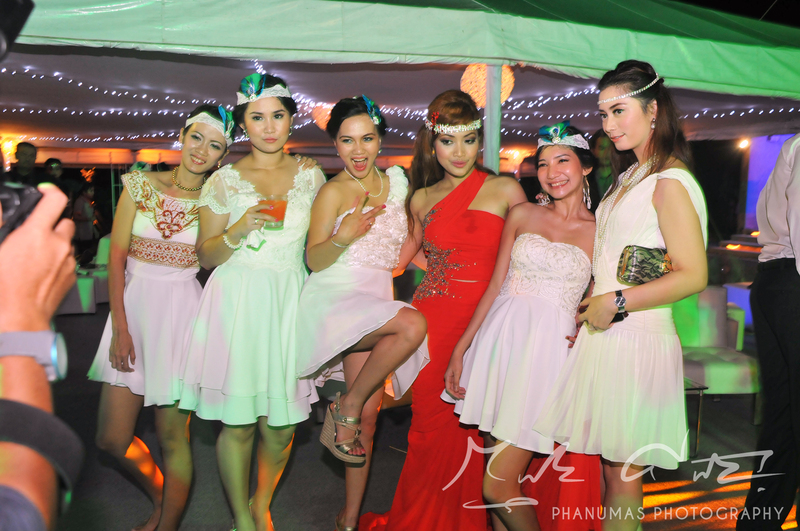 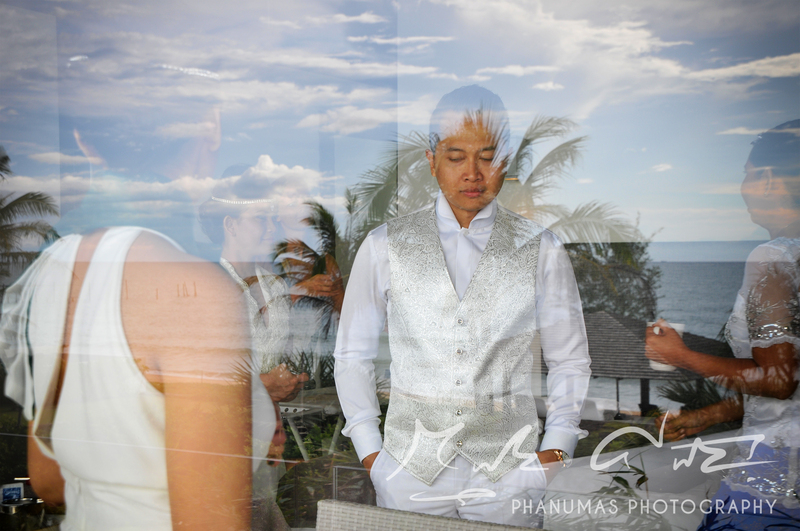 As all brides should, Devi had Lisa Allen, the fantastic make-up and hair stylist located in Phuket, Thailand. 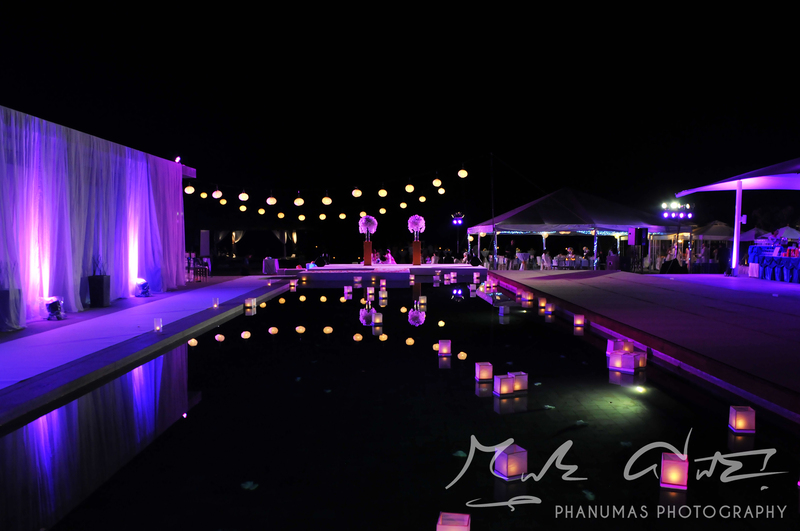 The bride and groom said their ‘I Dos’ in a secular ceremony with a stunning aisle set over the swimming pool. 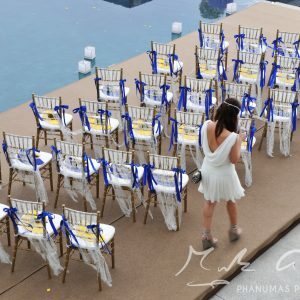 They chose white, sunshine yellow and royal blue as the colour scheme, with white phalaenopsis orchids to complement their elegant and luxurious theme. 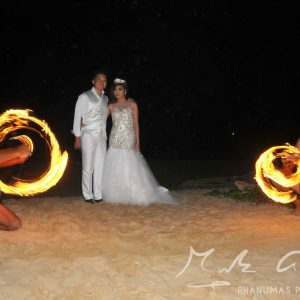 Needless to say, they didn’t want any moments missed. 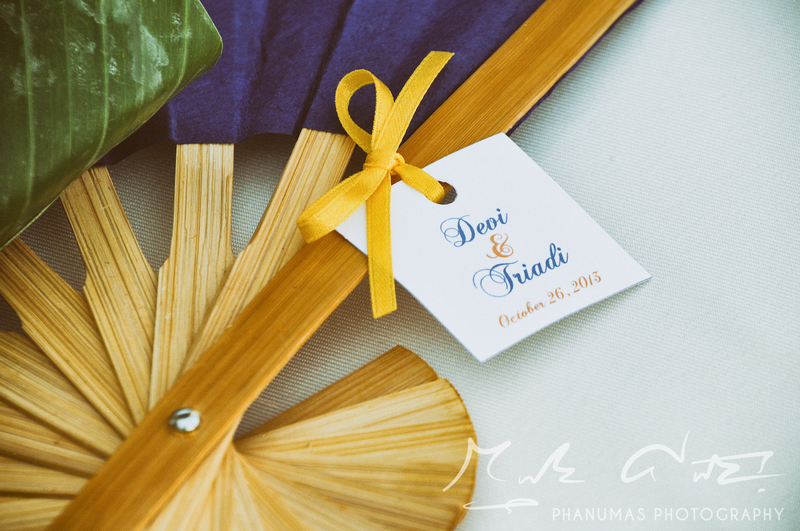 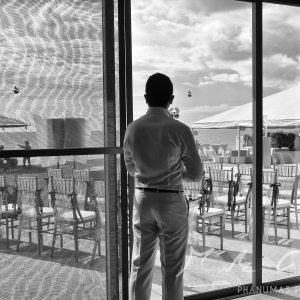 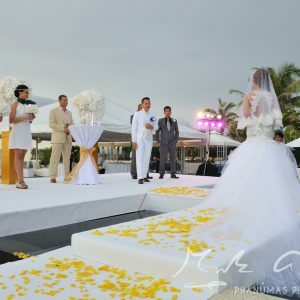 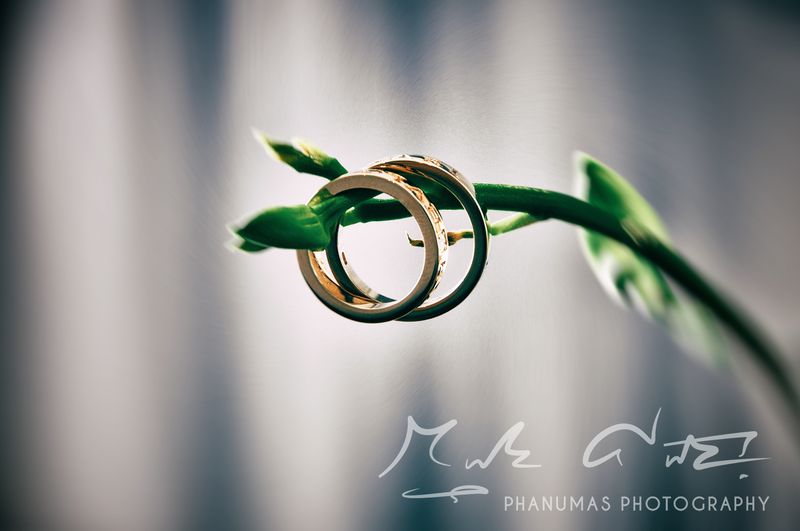 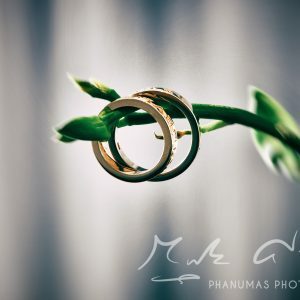 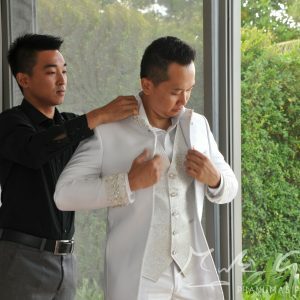 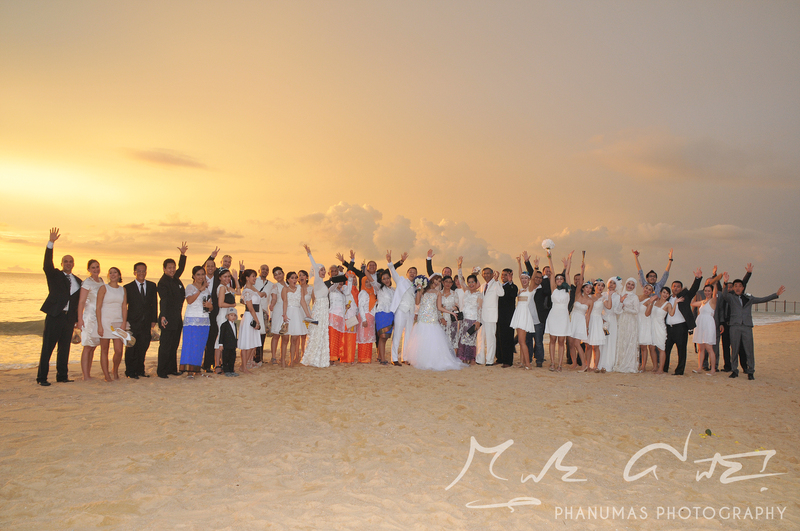 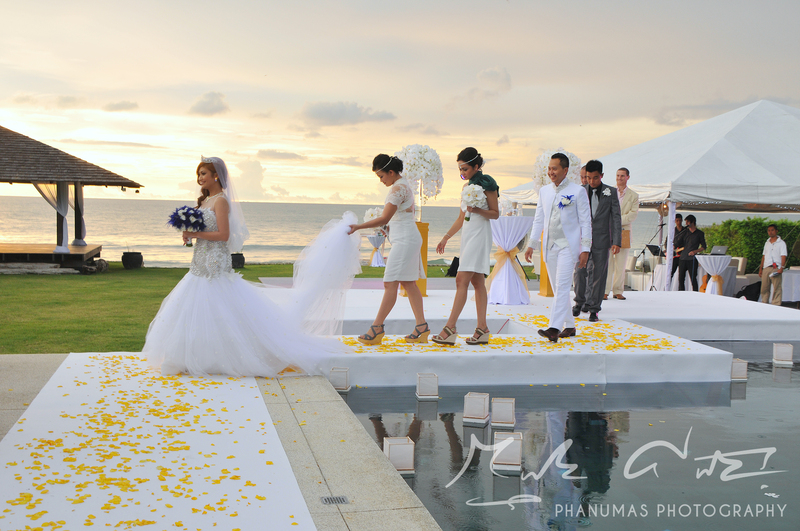 To have the memories form such a loving and emotional wedding ceremony, in Thailand, captured by a professional Phuket photography and camera team, so they could enjoy for years to come. 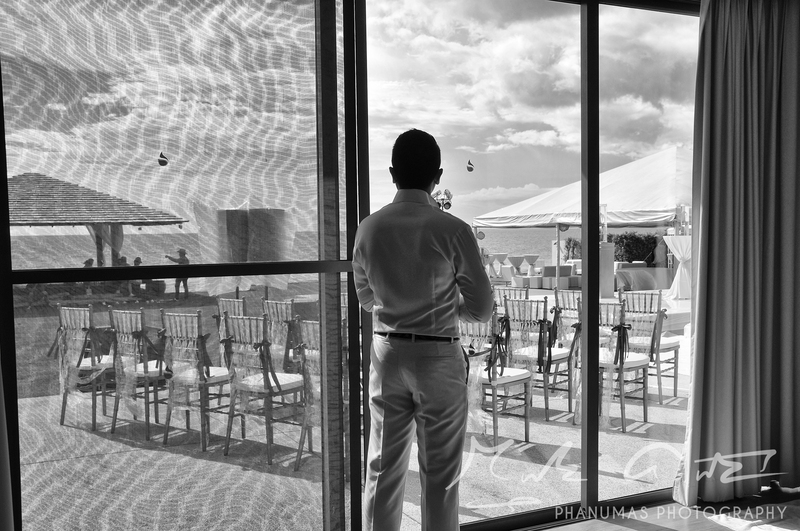 The fun and games started at the cocktail reception overlooking the Andaman Sea. 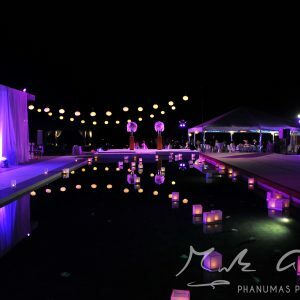 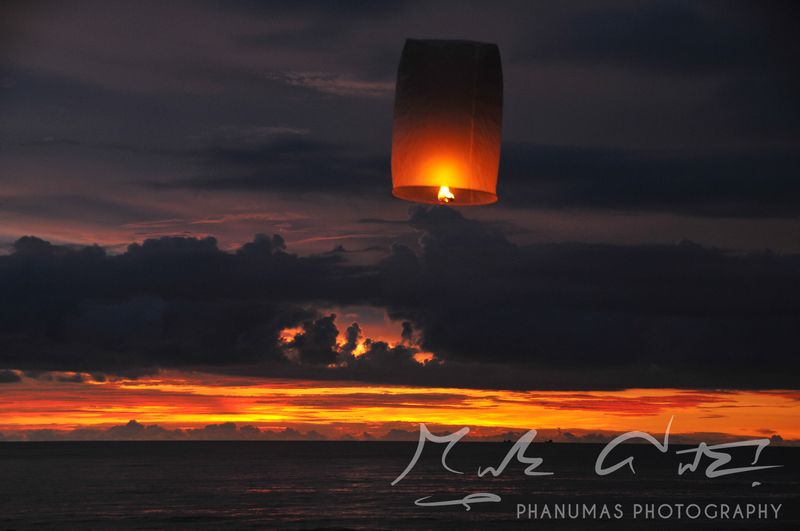 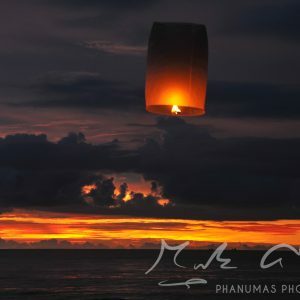 Just after watching an amazing Phuket sunset, fire lanterns were released by all the guests. 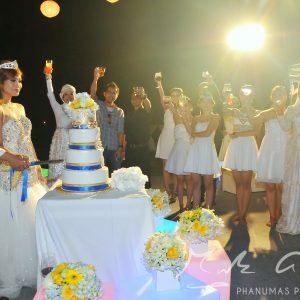 The wedding dinner commenced with a tasty buffet of Thai cuisine, with Halal cuisine as most guests were of the Islamic faith. 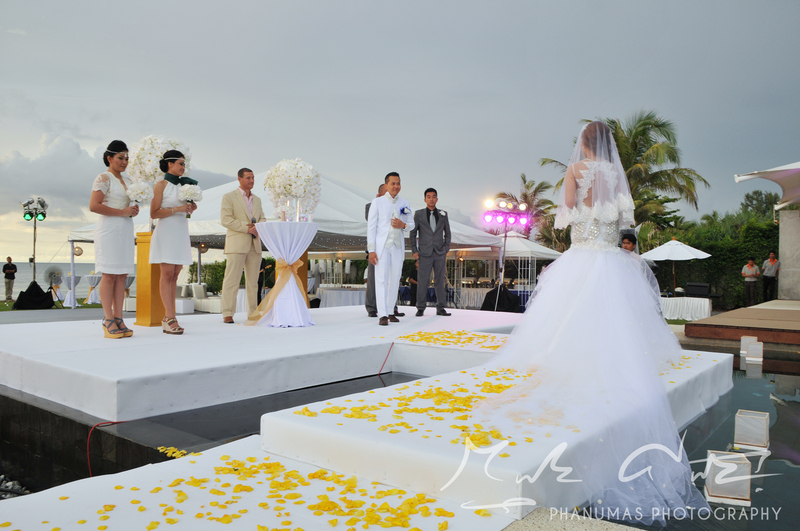 The wedding cake was a stunning four-tier design from Peter Webber. 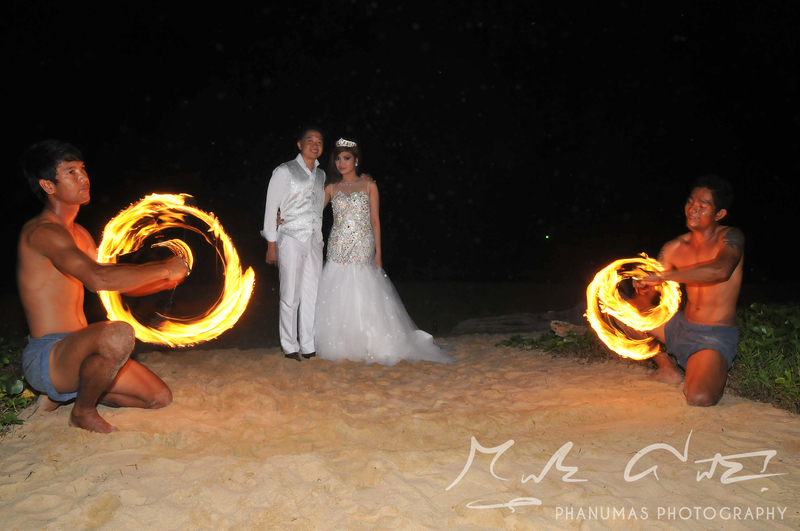 The entertainment started post dinner with fire dancers, a surprise fire sign for the bride and groom and finished with fireworks. 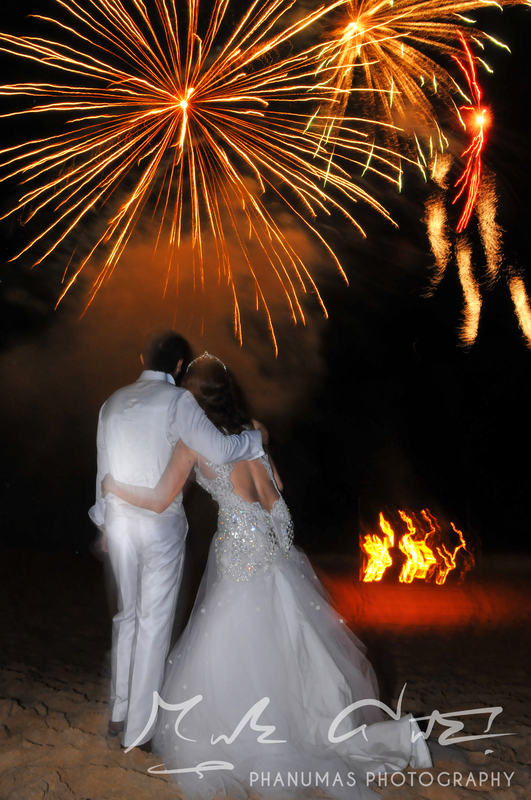 All provided by the professional firework team headed up by Chris Dawson, from Fireworks Thailand. 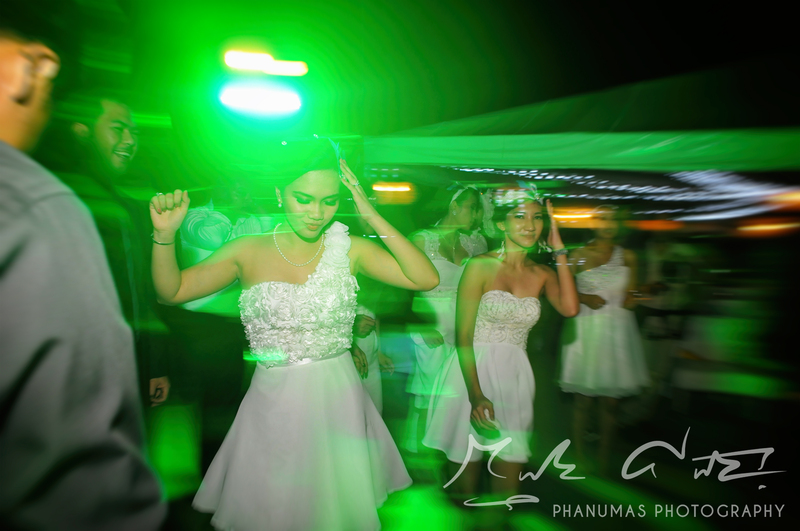 After a change of dress for the bride and groom, they took a more relaxed approach and put on their dancing shoes to take the floor for their first dance. 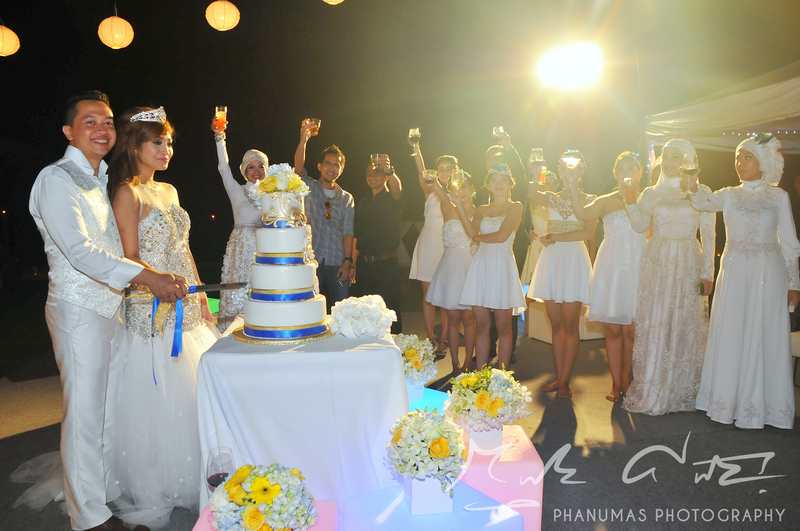 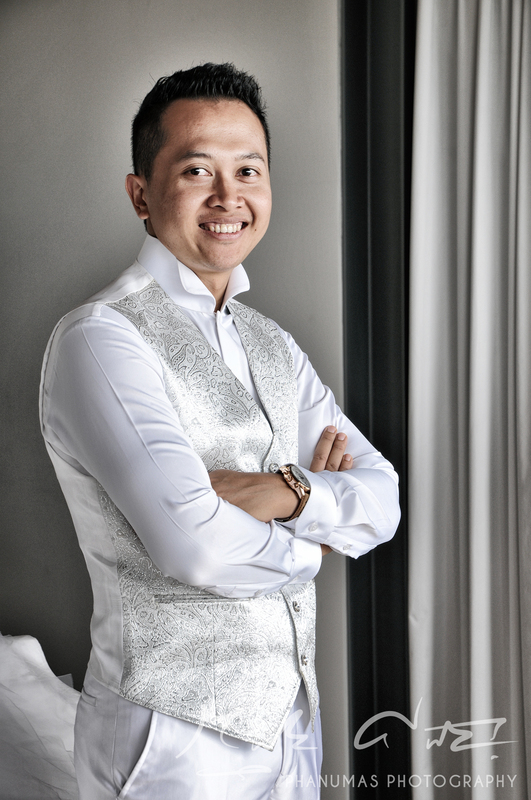 Larger than life and a personality to match, DJ Tank, kicked the wedding after-party atmosphere off, spinning the decks to ensure the bride, groom and their wedding guests could party the night away into the early hours at the stunning wedding location of Sava Villas, Phuket Thailand, overlooking the Andaman Ocean. 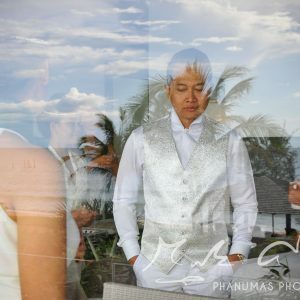 I am eternally grateful to the super lovely and equally fun bride and groom, Triadi and Devi, for putting their faith in me as a professional photographer and my video team here in Thailand, to capture the tears of joy, emotions and fun at their Phuket Wedding.